Finally I am back! I apologise for my absence, I have been under the weather and busy with moving house, but I am back now and have a lovely little recipe to share. Since some of my most popular recipes on this blog are meatballs I thought why not do another? In the past I have done chicken, lamb and beef, but today I am here for my pescaterian followers…or just the ones who, like me, love salmon. This recipe is so simple it can be done in 15 minutes, so it’s perfect for those weeknights, when you come from work, tired and depressed at having to travel home in the cold. Preheat your oven at 220C. Now take all your ingredients except for the fill and breadcrumbs, put them in a food processor and whizz it up. I used my nutriblender and it worked fine. Just a couple of pulses to get the salmon to break up. It will look like a lumpy paste. Fold in your doll and breadcrumbs, and shape into balls. Lay out on a baking dish and bake for 12-15 minutes, until the meatballs feel firm and start looking golden. Enjoy either on their own with a nice dip, as a side, or in a salad, last night I served them with a lovely asparagus jasmine rice and simple side salad. I love salmon in any form and I’ve made meatballs before, slightly different recipe, though. I’ll have to try this. Thank you for sharing! Thank you. I am sure I will 🙂 to both! Oh wow! 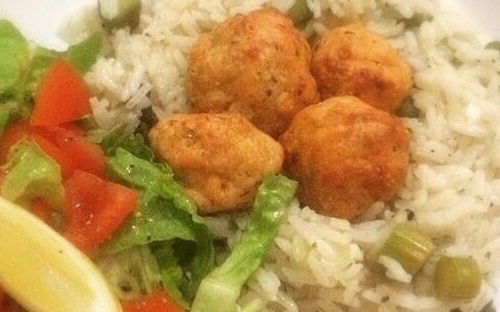 Salmon meatballs sound incredible. Thanks for sharing this!! Love salmon, makes me hungry.When dinner served . Lool salmon is lovely ? I’ve been on the hunt for new recipes and I’ve noted this one down and I will be trying this out very soon.